It’s time for another edition of Int’l Bloggers Club and because Christmas is right around the corner, we decided to do a gift wrap idea theme. 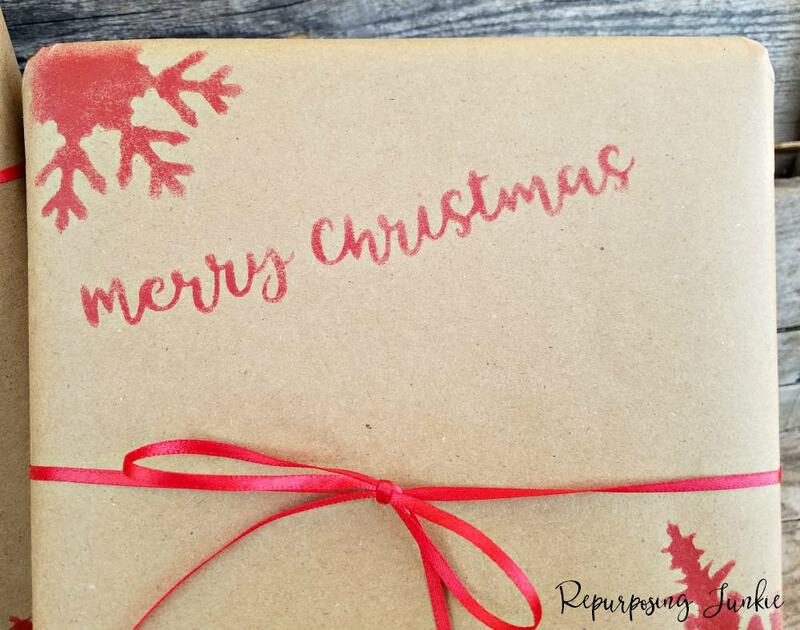 I’ll be sharing How to Stencil Gift Wrap for Christmas using Kraft paper and some stencils. I hope you enjoy all the gift wrap ideas that my friends and I will be sharing. I wrapped the boxes using Kraft paper and tape. I made some stencils with phrases that are appropriate for Christmas gifts; I’m offering the SVG and JPEG Words/Labels stencil cut files for free in my Resource Library. I also chose to embellish the gift wrap with snowflakes. I had purchased the snowflake SVG files from an Etsy shop last year for my daughter’s Frozen theme birthday party. It appears that the shop has closed, but since then I have designed some snowflake stencils of my own and they can be found in my resource library, that can be used for free on personal use projects. I cut all the stencil files on my Cricut. After all the stencils were cut and ready, I applied them to the Kraft paper. Very little paint is needed when stenciling, especially on gift wrap since you don’t want paint going through the paper and onto the gift and ruining it, so use caution when applying the stencil, or simply stencil the paper before wrapping the gift. I wrapped the gift with some red ribbon that I purchased at Wal-Mart for 47 cents, not too shabby, and it was just the right touch to finish off the gift wrap. What do you think of the personalized gift wrap with stencils? I hope you have enjoyed this post! Don’t forget to check out some more gift wrap ideas from my friends! 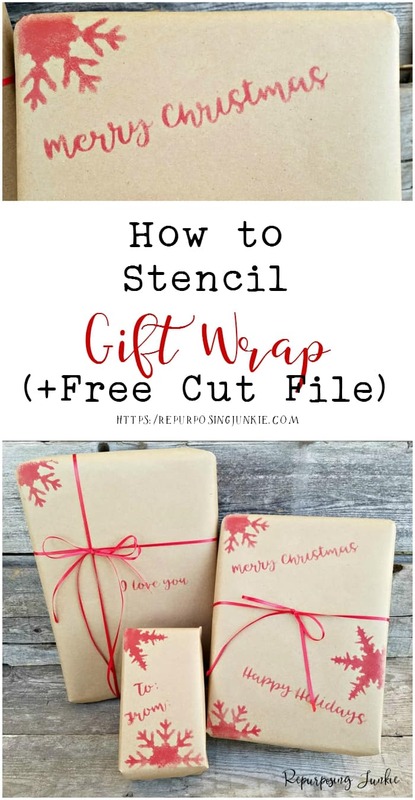 Thanks for sharing this post on How to Stencil Gift Wrap for Christmas!! Keri this is such a great idea. You can create custom paper now. Love the Kraft paper, it is so versatile. I just bought a similar stamp with a snowflake design but I really like this idea with the stencils. Thanks Keri. Thanks so much Mary! I’m glad you like the stencils. great idea!! loved how they turned out ! I’m glad you like it Tara! All my gifts this year will be getting stenciled. I totally love these Keri! I couldn’t bear to tear them off! Keri your stencils are just the BEST thing! So cute and I love the simple kraft paper idea and then using these beautiful stencils to dress it up and personalize it! Thank you very much Pili! 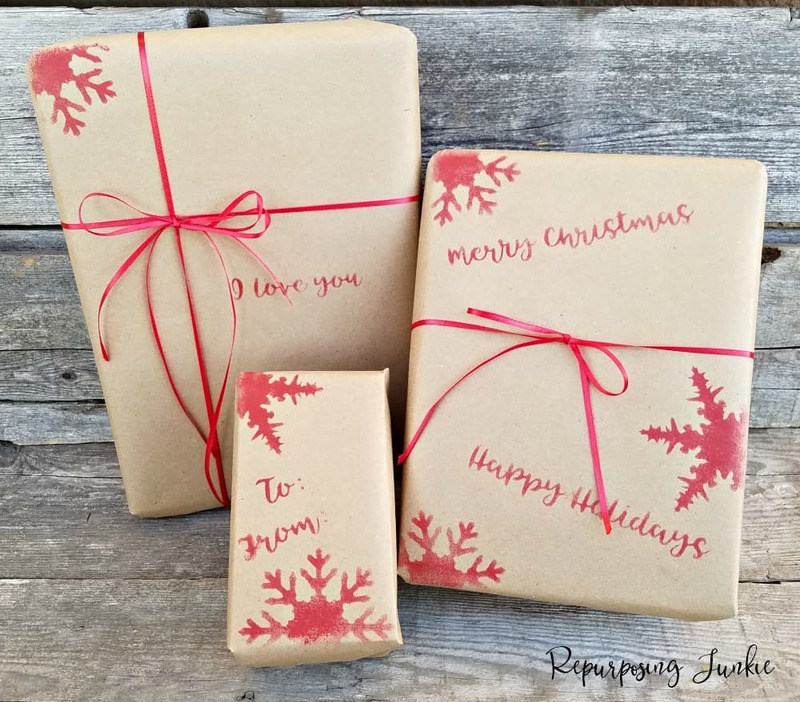 I love this idea of personalizing your gift wraps and I love the red against the brown. Well done.